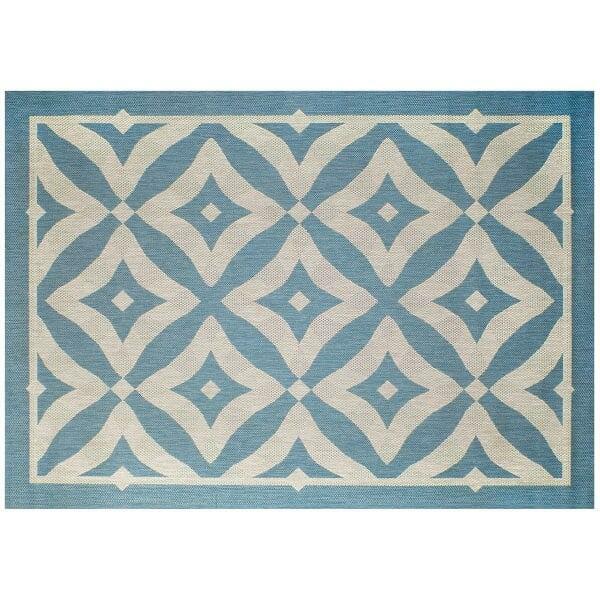 The Charleston Spa Outdoor Rug features a curvy diamond design of pale blue pattern over a beige background. It creates a cool, calm aesthetic that is ideal for matching with subdued patio or outdoor kitchen furniture that is tan and light, white, or features light wicker or wood. The beach tones are made to last, regardless of exposure to the rain and shine of changing seasons. The outdoor rug has a polypropylene construction. Polypropylene is a durable material that has protective qualities, but is also capable of superior comfort. Insulating undergarments, for example, are often made of polypropylene. The motivation for adding an outdoor rug could come from a variety of angles. An outdoor rug adds a splash of color and style that is easily changed as seasons or tastes evolve. It can serve as a budget friendly furniture piece that ties an area together. And, it adds superior comfort to the spaces that often fall flat on their face when it comes to flooring. Cover up that concrete with a comfortable rug. You have the power to build yourself a fully functional outdoor room! This item ships via UPS / FedEx. Most delivery times within the Continental U.S for in stock patio accessories range from 2-5 business days depending on location. All in stock orders received before noon will ship that SAME DAY.